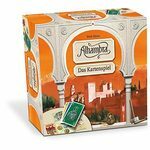 Alhambra The Card Game - a game for the whole family, easy to learn and great fun to play! Who will succeed in owning the most bulding cards of certain types just at the right time - that is the time of scoring? Other products in the "Alhambra" series.